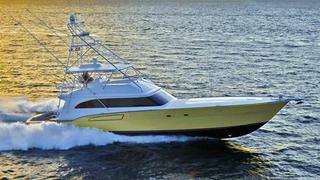 News just in from Thom Conboy at Merle Wood & Associates as he sends word of a $1.4 million price drop on his central listing, the 24.38m sportsfishing motor yacht R80. Built by Donzi in 2009, R80 was delivered in 2010. A refined custom interior by Lourdes Cueto creates a warm ambience for six guests in three staterooms and this superyacht also boasts a new, innovative underwater exhaust system. Twin 2400hp MTU engines give R80 an exhilarating cruise speed of 34 knots and a maximum speed of 42 knots and the asking price is now down from $7.3 million to $5.9 million.